i think it is officially the summer of sleepovers. since school has been out once or twice a week either one, two or three of my sisters kids are sleeping over. 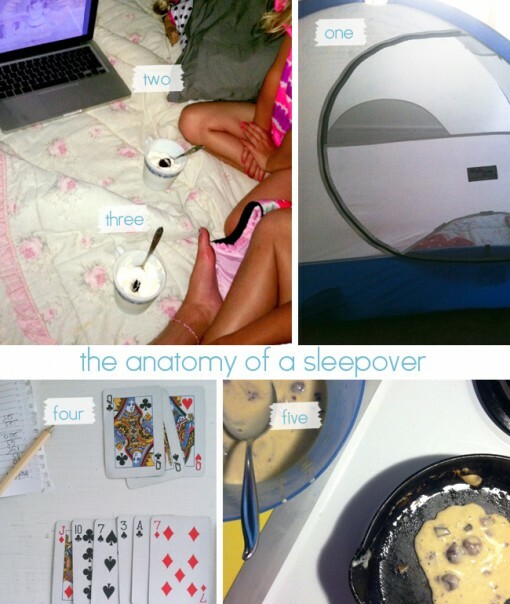 here’s what it takes for a sleepover at this auntie’s house. one: a tent. this tent is pretty much always set up in my spare room. the tent has travelled all over northern america but is now serving as the sleepover spot of choice for my nieces. two: itunes. for the girls it is marathon episodes of punky brewster. it was one of my favorite shows as a kid, so i am glad they are enjoying it now. for the boy it is psych – one of my favorite shows now. i’m a good influence on these kids. three: a snack. usually i don’t have much food in my house, but i am known for making something out of nothing. this time it was leftover cream from my nieces ice cream cake. i whipped it up with a little bit of sugar and crushed in some cookies (also leftover from the cake) and then froze it a bit. four: cards. when i was a kid my grandmother and i would play cards, so i am glad i am keeping the tradition alive. the middle one and i have a running rummy score going. five: pancakes. i swear these are the only reason the kids even sleep at my house. this batch had some raspberries and chocolate thrown in since i was out of syrup.